Debunked: Video Of Tamerlan Tsarnaev NAKED, Handcuffed,Walking Alive! Discussion in 'Boston Marathon Bombings' started by Mick West, Apr 21, 2013. Making the rounds if the suggestions that video showing an uninjured naked man in custody shows Tamerlan Tsarnaev, who later turned up shot and dead. Tamerlan Tsarnaev was 6'3" tall, and this man is obviously much shorter, and has a very different face viewed from the side. Here is my ID evaluation. I mapped the features of the same profile photo of Tamerlan Tsarnaev and a clearer photo of "naked man" as he was being photographed by law enforcement. My conclusion is they are not a match. 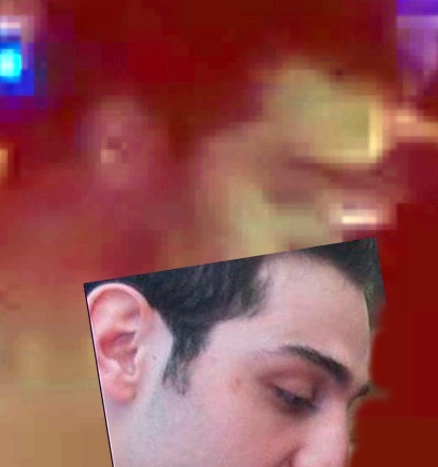 Please take particular note of the prominent brow/nose and deep set eye on Tamerlan Tsarnaev. The reporter describes the location as: "558 Mt Auburn St, roughly where Dexter runs into Mt Auburn st"
However, the naked man is not Tamerlan Tsarnaev. He was "an unknown person of interest". Just someone who happened to be in the area, who looked like the suspect, so he was detained. At one point, an unknown person of interest stripped naked—presumably at the request of police to ensure he was not carrying some type of explosives—and was captured on camera by CNN walking in police custody. It is unclear what, if any, connection that man had to the unfolding manhunt. CNN reports that he has since been released, although police have not yet commented about the man on the record. Besides him having a different face, another fairly obvious problem with the theory is that Tamerlan Tsarnaev was 6'3" tall, and this man is obviously much shorter. As you probably know RT Facebook is a magnet to crazy CT's. There are loads of theories doing the rounds on their threads. Too many to list. One crazy soul whom likes to frequent the "Posts written by others" is none other than Carl J. Allen (or should that be "Alien?") whose still to find me a Truther group with 5,000 members despite me lowering the target (from 10,000 to 5,000). I posted a link to this thread on Facebook. Here us his reply. Ps- using forum runner on the iPhone so if the image does not come out, I'll have to correct it on a laptop later today. "the only problem I see with the photos used to debunk the story here is, the man on the ground has longish straight brown hair which covers his left ear, the man being put into the cruiser has very short curly hair and is well above his ears. Are the two supposed to be the same men? Or did the stop two men and had one of them strip naked?" They are the same guy. The shot of him laying down makes it look like he has longer hair because the light is coming from the left, illuminating his hair, and casting shadows down his face. The shot of him walking is lit by red and blue police light lights below head height, so his face is illuminated and his hair is darker. . Just very different lighting. See the two shots of him laying in the ground. One seems to have black hair, one is almost red, but its the same guy. I understand your point on the lights, but the last image on the post showing both Tamerlan and the other man who is standing. His hair is a very different texture and is not touching his right ear. If he were standing the man shown laying on the ground's hair would be well over his ears I think. In both images on our screens (we work with photos all day so they have very precise color matching) the hair of the man on the ground looks brown. Yes, it probably is brown. But there it's been brightly lit by white light, so you can see the true color. 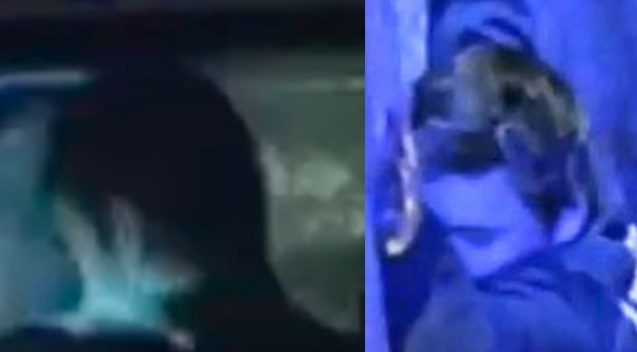 It's impossible to see the color in the naked video, as he's illuminated by dim red and blue lights, his hair is nor directly illuminated, and the resolution it too low. Ive been looking at conspiracy theories for years now, and everytime i look at them im hoping that someone debunks them! And i said to myselfe that if this one gets debunked too i will stop looking at conspiracy theories! But i am not really pleased with this one, i am not so sure about the argument that he is not tall enough in the video to be tamerlan, and on this video: http://edition.cnn.com/video/#/video/us/2013/04/19/vo-suspect-perp-walk.cnn their faces seem identical! sometimes i think that the nouse is not his, but then when i look again i think differently, i hope someone helps! I can get by the differentiation in hair color due to the lighting, however the man on the grounds hair had an entirely different length and texture, as in the above images. Even along the temples. If you take a close look at the video, their is a flash of a moment as he is seated in the cruiser which show a side view, fairly well lit. The man on the grounds hair is quite long as it is long enough to cover his entire left ear, the fellow seated in the cruiser has very short hair and appears very curly in texture. 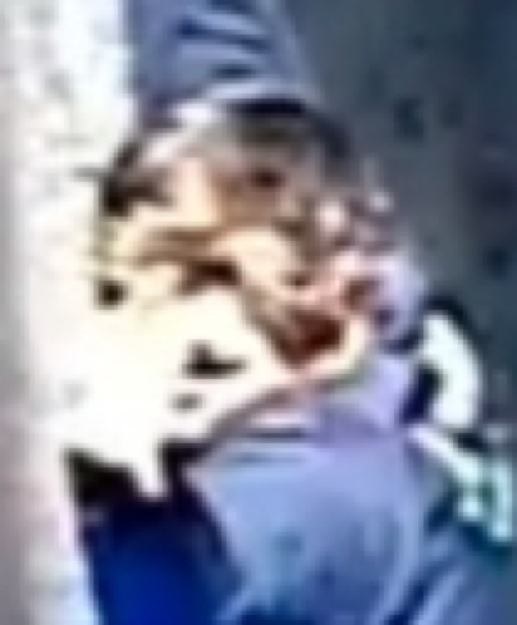 I do not think it is Tamerlan, but I do think two men were involved other than the suspects judging from the images. I guess you are right about the forehead, i did not notice that! And now i think that their jawlines are not the same. But i still think their nose and chins look very similar! At least in the frame i chose. And about the ears...i am not sure. I wish the video had better quality. His head is angled down a bit more than it initially appears. I'm not 100% here, but I don't have a strong reason to think it's a different guy unless new information comes forward. Either way, the key point is that it's not Tamerian. I agree now, that the guy in the video is probably not tall enough! The rumor that Tamerlan is the naked guy was bugging me so much, that i did not sleep enough, and that distorted my perception. Unfortunately i am still not sure about this, but i guess i should be. 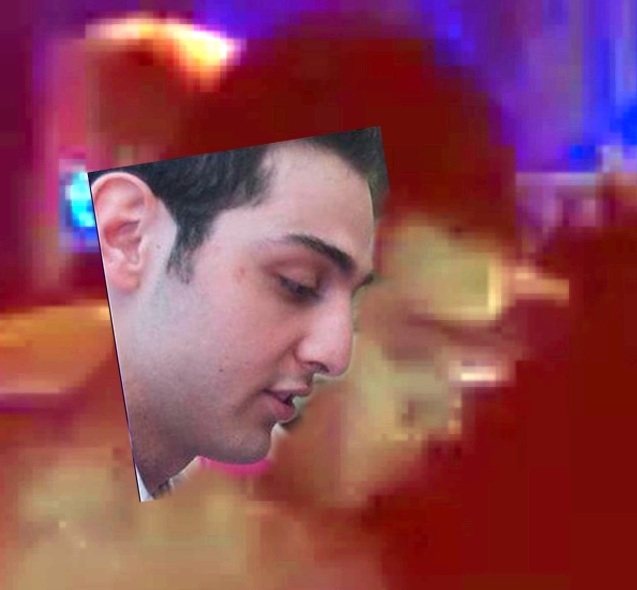 Though i definitly agree that the guy in the video is not tall enough (if the car he stood next to is a Ford Crown Victoria Police Interceptor height max:1,48m), i still think that his neckline, hairline, nose and chin are identical to tamerlans (naked guys forehead might seem smaller because of hair covering it). Now you might ask quite rightly, why i am still unsure if i know that tamerlan was taller? Because im flabbergasted by the other similarities. I just saw this, and... alright the similarities still surprise me but, i guess thats my problem. I forgot how alike unrelated people can look! There are too many coincidences in this world, some peoples brains dont like that fact! Some things seem to be connected, even when they are not. Who would the police accidentally detain out of all the people in Boston, if not the guy who looks a bit like him? and in the final one the are clearly not equal..... if you debunk stuff please show but dont just effectively lie to prove your point, makes me less trusting of debunkers even though their useually the ones speaking the truth. you dont explain why it isnt covering his ear? The naked guys has no body hair at all. There are many photos of Tamerlan with lots of body hair. Its that simple. Pan Am 101? that was not the CIA. 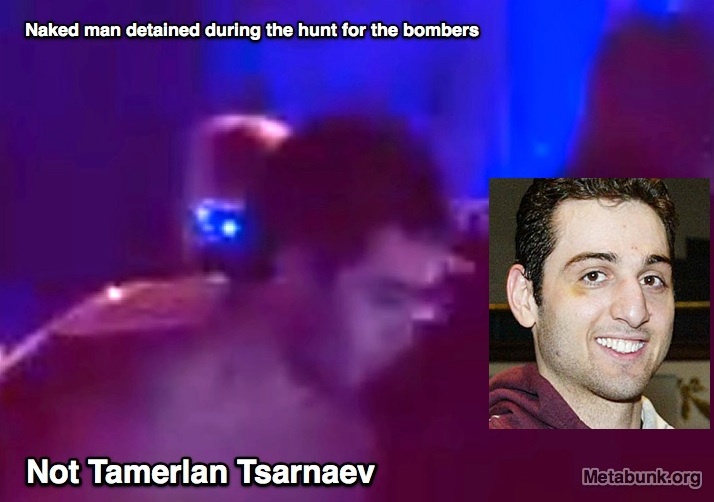 Tamerlan was killed in the shoot out, for which there are photos here http://www.abovetopsecret.com/forum/thread942547/pg1, before this completely irrelevant guy was arrested. He was arrested because he fit the general description of the younger brother. Tamerlan was already dead. So why does anyone need to explain why his hair isn't covering his ear to you? The ears are not the same. Great! That should put the matter to rest. I'd not see that side photo. I'll add your comparison to the top post. The shootout and Tamerlan's subsequent death started around 12.50am. This man was arrested later when the manhunt was on for the younger brother, don't know the exact time but it might be around two. So the claim that it shows Tamerlan alive who later turned up dead is false. Unless time-travel technology is now in play, which is a distinct possibility. Together with Pete Tar´s argument, and of course Micks posts too, and Trigger Hippies Post, its now clear to me! And i am keeping my promise that i gave to myselfe! The next time i want to give some "theories" a chance, i will come here first! Just a question Mick but has this pic been looked into it's self and if so can I get pointed into the right direction to conduct my own research. Not trying to sound ignorant or anything just curious as I myself like to question every little thing n not saying that pic is a fake or anything just wanting to know more into this as if not mistaken was a pic to reportedly sent to officers while still in manhunt for younger brother, and frankly myself find it not to be acts of equality or justice on the behalf of the officers/agents as these two were just suspects and are to be considered innocent until proven guilty not guilty until proven innocent. Sorry if I veered off topic here as thread is about debunking the video that has spread viral across the net and is pretty obvious that the two don't match, but it does not debunk the actual case and motives or agendas that are at hand and still don't know the whole story or truth as there is many questions being ignored and un answered. This is my first post here as I had just registered while looking into the video myself and debunking if it was him or not for myself rather then being told if so or not, and had seen another thread dealing with this actual case and bombings, but after reading through thread seems better if I just steered away from it and why decided to post here as I am interested in the photo quoted above and the fact that it seems the officers/agents had already gave their trial by self and deemed these two guilty and wanted to play executioner as well. That to me is not equality and sure not justice. Idk and again am very sorry if posted in wrong thread and detoured off subject of the video it's self. His mouth is agape. His face is awash in blood. On the left side of his body is a wide gash where doctors cut him open to try to save his life. The image of Tamerlan Tsarnaev, dead and naked on a slab, snapped by an unknown person, was e-mailed repeatedly around law enforcement *circles on Friday. “Suspect 1” was written above the gruesome picture of the man who was killed in a shootout with police early *Friday. Seeing a photo of one of the Marathon bombing suspects dead was cathartic, said one law enforcement official who saw the picture. Obviously the details of the man detained and released will be redacted. No amount of evidence will convince irrational persons of the truth. CTs demand answers, but when answers are given they simply become more convinced of a cover-up. CTs demand proof, and where proof is given they will dismiss that very proof itself as more evidence of a wider conspiracy (they must be in on this too, that could have easily been forged/photoshopped, etc). The fact of this case just don't add up and as with previous so called terrorist attacks and terrorist drills happening within area based on similar sito there is a lot of questions which arise. As well as the larger picture of it all being who are the real terrorist. That's what CTers say about everything "the facts don't add up". You're just casting doubt, not providing facts. I've been following the recent events closely and have been interested by all the conflicting positions. Regarding the face mapping comparison, I just want to clarify who the man in the side-view photo is. It looks to me like he isn't the naked man in the frame above. First, the man's eyebrow is not as pronounced than the naked man's. Second, the man has shorter sideburns than the naked man's. A case could be made, that this is caused by shadow on the naked man's face, however judging by the light lighting up the right side of the naked man's face, this would seem implausible. 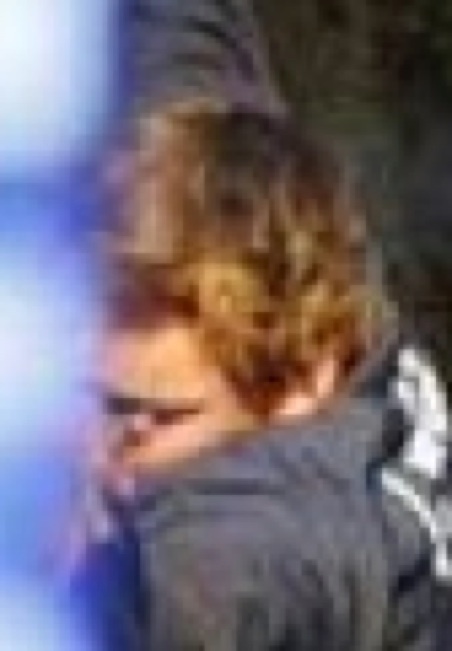 Thirdly, the side-view photo looks to be in police uniform. You can see his vest and kneepads in the photo, and a possible device or badge on his shoulder. A case could be made that the man was made to put on a police uniform after being arrested, but this again, seems like an odd thing to do. Surely he would have been made to wear his own clothes or no clothes for photographing, rather than a police outfit. If he was made to wear the police outfit, from where was he given it, and why was it necessary to also attach the vest, kneepads, and shiny device on the shoulder. It seems to me, the face mapping was inconclusive, because we are looking at two different men - a policeman and a suspect. Sorry for the double post, didn't mean to post it twice. I think you have a point - I was not looking closely at the rest of the image. I've removed it from the top post for now. Does anyone have a link to the video the profile shot is from? It's not really clear what we are seeing. Mr Mister, your post appears above my response above, you don't need to keep re-posting it. Okay, well. Where to even start? To begin with, I recorded the entire thing as it unfolded on CNN live in HD. I still have every frame on my TiVo and I'm working on transferring the actual video to my computer so I can upload it. I realize it's copyrighted, so not sure how much I'll be able to put up. So for now, you'll have to settle for frames taken with my phone. The man in the second photo is NOT a police officer, despite your observations. He is the suspect who has come to be known as "naked man". He is barefoot, wearing handcuffs, and his shoulders are draped with an oversized coat (possibly his own, possibly an officer's). The frame where you have circled "knee pads" and pointed out a "police uniform" is the only scene where I could get a clear capture of his face because a lot of the footage was going in and out of focus. It was apparently shot from a distance. That particular frame was unfortunately fading into the next piece of CNN footage which caused other elements to begin to appear on the screen. I'll try to get a clear frame without the other elements (police car, tail lights, crowd). I'll address your other points in my next post. But the man in the photo is "naked man" and not a policeman or any other law enforcement. Awesome work - fiddly and time consuming I imagine, just to prove a simple fact, but of great value in the face of current CT mania for one-upmanship in discrepancy-hunting. Any chance of getting a definitive time for this event for the record? The shootout occurred between 12:45am and 1:00am EST Friday morning. According to witness Andrew Kitzenberg, who photographed the shootout, a bomb was detonated during the gunfight and Tamerlan proceeded to charge toward the police line on foot, guns blazing. Then "As the one brother was running toward the officers the second got back into the SUV, turned it around in the street and proceeded to accelerate at the vehicle barricade. (12:50am EST)" So Tamerlan was down before 1:00am Friday. We've subsequently learned that he was shot multiple times during the gunfight as he charged police, and that Dhzokhar may have run over him as he made his getaway in the SUV. It's unlikely Tamerlan was ever walking around after this event. The manhunt was on for Dzhokhar, who abandoned the SUV a short distance away. At 3:55am EST (three hours after the gunfight), CNN is reporting on a "massive police operation" following a police shooting, carjacking, pursuit and gunfight. At 3:59am EST CNN announces that a suspect is in police custody and another suspect is on the loose. They reported that a suspect had been stripped, handcuffed, and placed in a police vehicle and said that the FBI was trying to determine if the man was involved in the gunfight or connected to the marathon bombings. CNN began showing footage of "naked man" at 4:00am EST, but did not identify him. 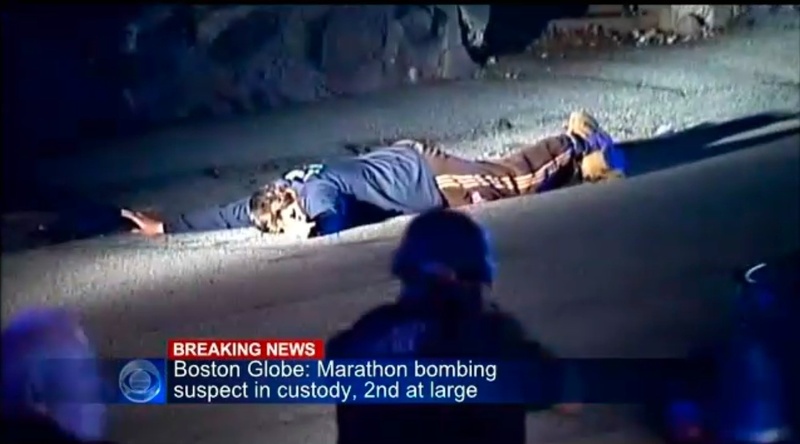 At 4:00am EST CNN announces that FBI has questioned and photographed a man in custody in Watertown. At 4:01am EST CNN announces the man in custody who was previously stripped and questioned has now been dressed and photographed. They roll footage of the man (still barefoot and in handcuffs) being photographed. At 4:05am EST CNN rolls footage from another "affiliate" of law enforcement pointing guns at a man in striped sweats, laying on the ground. CNN then runs repeat footage of "naked man" as he's being put into the police car. At 4:06am EST CNN announces "naked man" has now been questioned three times by law enforcement and is still being held at the scene instead of taken away. The reporter comments that he finds this "somewhat peculiar". At 4:07am EST CNN runs repeat footage of the now dressed "naked man" being photographed while barefoot and in handcuffs. At 4:11am EST CNN runs repeat affiliate footage of man on the ground. CNN announces that Middlesex District Attorney has released a statement about the MIT shooting, carjacking, pursuit, and gunfight. At 4:13am EST CNN announces the Middlesex District Attorney's office has released a statement that during the gunfight hours earlier, one suspect was critically injured and transported to the hospital where he was pronounced dead. There is still a manhunt on for a second suspect. At this time, CNN runs repeat footage of "naked man". At 4:16am EST CNN reporters begin to discuss the possibility that "naked man" may not be one of the suspects, since one suspect was killed in the gunfight and the other is still at large. They report that it is still unclear who "naked man" is, and then talk about possible "false hits" during the chaos of the operation. They repeat for residents of Watertown to stay indoors. At 4:18am EST, law enforcement spokesman holds a news conference where he announces that several bombs were involved in the earlier gunfight. One suspect was "struck" and taken into custody. The second suspect fled in a vehicle and there was an "active manhunt" being conducted by several law enforcement agencies. The announcement of Watertown's "Shelter In Place" was made at this time, instructing people to stay indoors and answer only to uniformed law enforcement. At 4:20am EST, during the news conference, law enforcement announces the suspect #2, the subject of the manhunt, is consistent with the "white hat" bombing suspect (we later learn is Dzhokhar Tsarnaev). A reporter asks "Suspect #1 was shot?". The law enforcement spokesman says "That's correct." At 4:22am EST, the suspect on the loose was now being called "terrorist". At 4:26am EST, CNN announces that CNN photojournalist Jay McMichael has breaking news that the man stripped, detained, questioned, and photographed (naked man) has now been released. No more footage of "naked man" is run following this announcement. Still working on getting this footage to my computer. I have been searching for actual photos of Tamerlan on the ground before OR after he was run over but I can't find any. I've been trying to search for answers about why with so many "dozens" apparently of law-enforcement surrounding the brothers on the night of the shoot-out how none of them was close enough to take them both alive that night. Although I am NO conspiracy person and love debunking stuff myself, I find it way too abnormal for there to be NO photos or videos of what happened at the time Tamerlan was actually on the ground. Obviously the press would be well clear at that point, seeing as there was a raging gun battle. That just leaves the police. There are no photos of many people who were involved in police shootouts. Why would they release photos? Seems like the obvious standard procedure would be to NOT release photos of dead people.